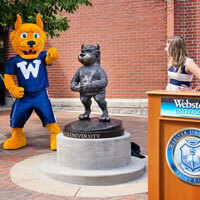 Past and current SGA presidents Gaby Deimeke and C. Wiley unveiled the Gorlok statue with the help of the mascot. A new symbol of Gorlok pride was unveiled on the Webster Groves campus with the installation of a bronze Gorlok statue between Emerson Library and the Sverdrup building. The statue was conceived and funded through a student-led "Project Gorlok" campaign that engaged 75 student and alumni donors. One of the Project Gorlok donors who helped make this fun new emblem of Webster student pride possible is Alexandria McCuien, BA ’10, MBA ’15. McCuien became an honored Daniel Webster Society member with her gift to Project Gorlok. “While at Webster my most memorable moments were the times I spent with my peers in the organizations I was in, especially student ambassadors," said McCuien. "Being in this group, I was able to touch so many lives and interact with donors to let them know how appreciative we were for their investments in our education and to hear more about their story. Former student government president Gaby Deimeke and current president C. Wiley, key leaders on the project, spoke about what it meant to them at Monday's unveiling and dedication ceremony. See photos of the event -- and the Gorlok in bronze -- in this Facebook post.